"One of my favorite activities is to spelunk local caves looking for treasure." "When I spelunk, the only 'treasure' I find is bat guano." "'a cave, cavern, a vault,' c.1300, from Old French spelonque (13c.) or directly from Latin spelunca 'a cave, cavern, grotto,' from Greek spelynx (accusative spelynga, genitive spelyngos) 'a cave, cavern,' from spelos 'a cave.' 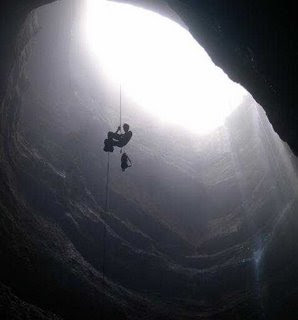 An adjective, speluncar 'of a cave' is recorded from 1855."